Rita explores ways in which to have a healthy relationship with alcohol. 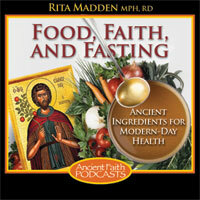 Welcome, everyone, to another session of Food, Faith, and Fasting. Today what I thought we could do is talk about a subject matter that is mentioned approximately 200 times in Holy Scripture. Do you have any idea what that subject matter might be? Well, if you guessed alcohol, you are correct. Specifically, when we read Holy Scripture and the times, it was more wine that was consumed, but when we look at this material now, we are going to focus on wine, alcohol, and liquor. So we’re going to look at them all together. What does our relationship need to be with alcoholic beverages? If something is mentioned approximately 200 times in Holy Scripture, I think there is probably a little bit of importance to it for our everyday lives, and trying to drink alcoholic beverages in a manner that glorifies God. Before I continue on, I just want to say that the lecture material covered today is focusing on people that can have alcohol. If you have some sort of illness or if you are dealing with sobriety, this is a lecture that is looking at how people can embrace alcohol that are okay to do that. We know people that are struggling with sobriety. That is their struggle, and as their brothers and sisters in Christ we are called to support them and to pray for them. But, again, just a short disclaimer. I just want to mention that this lecture is geared to people that are able to consume alcohol in a moderate manner. We’ll discuss what that looks like as we move along. I thought we could begin today’s session with a teaching from Cyril of Jerusalem. Many people eat plenty and grow fat on it. Others abstain from some kinds of food in order to practice asceticism and condemn those who eat. Put shortly, they have only hazy ideas why they should eat or why they should abstain. We, on the other hand, when we fast, give up wine and meat, not because we detest them, as though using them were a crime, but because we are hoping for an eternal reward. We willingly go without things that please the senses in order to be able to enjoy the pleasures of the spiritual table. We sow in tears today in order to be able to reap in joy tomorrow. Do not despise those who eat, when they are eating in order to keep their strength up. Do not condemn those who drink wine in moderation; it does their stomachs good. Never regard meat as an evil in itself. Paul has taken issue with certain people who forbid marriage and enjoy abstinence from foods which God created to be received with thanksgiving by those who believe and know the truth. If you abstain from those foods, do not do so as if they were unclean. Rather, think of them as a good thing which you are content to give up for love of a far greater spiritual benefit. This teaching is so beautiful to me because it is teaching us, it is showing us, that the table can be a time of pleasure when it is done in its proper context. Think about how just the aspect of having a little bit of wine with the meal changes the whole meal. I often think when an alcoholic beverage is present at the meal, it naturally sets the pace, to slow down mealtime. It is very hard to chug a glass of wine, right? You sip your wine; you taste how it complements the food. Let there be no drunkenness, for wine is the work of God, but drunkenness is the work of the devil. Wine makes not drunkenness, but intemperance produces it. Do not accuse that which is the workmanship of God, but accuse the madness of a fellow mortal. In addition, we see a teaching from St. Gregory the Great: Drunkenness is considered a manifestation of gluttony. So we want to recognize that God created this as a gift for us. Having an alcoholic beverage at a meal, as we just heard in the recent teaching, when we accept it with thanksgiving, it can be to our benefit. We hear in Holy Scripture, “a little bit of wine is good for the stomach,” “wine helps to gladden the heart of man.” We hear these teachings resonating, but we also hear the other end of it. Too much of it can be harmful for us. I want to share one more teaching, and then I want to take a look at the current scientific research that is essentially exemplifying this point of “a little bit is good; too much is bad.” Then we’re going to discuss some strategies on how to enjoy alcohol in a manner that is glorifying to God in a moderate and controlled and healthy manner. One more teaching, and this teaching is taken from Spiritual Works. When the ground has been watered enough, it produces good grain in abundance. If, on the other hand, it is sodden through a flood, it sprouts only thorns and thistles. It is the same with the ground of our soul. If we use wine with frugality, alcohol helps to make what the Holy Spirit has sown to grow luxuriantly. Instead, a bout of unrestrained drinking makes the ground of the soul slushy and incapable of producing any thoughts but thorns and thistles. So we see in this teaching a little bit is good; it helps the soul to experience a positive aspect, but too much ruins the soul. It can cause damage to the soul. We have to recognize that there needs to be an approach to alcohol that is a moderate and temperate approach. It is interesting, because we see this same information coming from the scientific world with its research. Too much alcohol can cause many problems. It can actually put you at risk for Type II diabetes. It can change your blood lipid profile and put you at risk for heart disease and high blood pressure. It can lead to memory failure. It can pull calcium out of your bones. So too much alcohol is not only harmful to the soul, it’s harmful to the physical body. But alcohol in moderation can do wonders for our health benefits. Now, when we talk about moderation, essentially we’re talking about, on average, one drink a day for females and maybe two drinks a day for men. You can take that range to about one to three drinks, maybe even one-and-a-half drinks for women, two-and-a-half to three for men, every once in a while, but on average, one drink for women, two drinks for men is a good gauge to go by. Just to give you an idea of what that would look like, you could equate this to one drink being a twelve-ounce beer or five ounces of wine or about one-and-a-half ounces of a distilled spirit. When we look at the research in terms of the health benefits, some areas of research are just focusing on red wine because of the anti-oxidants that are present in the red wine as a result of the red grapes being used. The research that I’m going to discuss now is going to look at all alcohol in general because, again, when we’re drinking alcohol in its pure state, you have to recognize that it is made up of all real ingredients. It’s made up of things that are found in creation. For example, if you look at beer, it’s derived from barley and hops. If you look at wine, it’s derived from grapes. If you look at scotch, it’s derived from peat. These things grow in nature; they’re a part of creation. When we focus on choosing our alcoholic beverages, first and foremost, we want to make sure that it’s a real beverage, because the health information that I’m about to discuss is very relevant to alcohol sources that are in their purest state. What I mean by that is you don’t want to mix some rum with a diet soda and think you’re going to receive these health benefits, because your body is going to be dealing with the chemicals that are found in diet soda, and essentially the health benefits [are] kind of a wash. That’s an easy way to sum it up, and we’ll look at it again as we move through the rest of the session. Essentially, we see… The American Heart Association just reported that moderate consumption of alcohol is associated with a dramatic decreased risk of stroke, and this has been seen in both men and women, regardless of age or ethnicity. Moderate consumption has been shown to decrease stroke. The reason they this could be true is because it helps in your blood lipid profile, so you have a better ratio of your bad and good cholesterol in the body. It also helps in reducing blood clotting, which can help in the prevention of a stroke. Interestingly enough, Harvard researchers concluded about coronary heart disease that the consumption of one to two drinks per day, whether it be in the form of beer, wine, or liquor, was corresponding with a 20-40% reduction in heart disease. So this is coming out of Harvard; this is research that is saying moderate drinking, whether it be in the form of wine, beer, or liquor, can reduce your risk of heart disease by 20-40%. The research actually goes on and on when it comes to heart disease, because they’re really seeing the biggest benefit with this. Again, another study—this is actually out of Harvard, too—they looked at 44,000 men and found that moderate alcohol consumption reduced their risk of coronary heart disease by 37%. Lots of benefits to drinking in moderation and having a healthy heart. We actually hear that in Holy Scripture, which is so amazing to see all this coming together. There is also some research saying that it may decrease your risk of dementia and diabetes, but what has been shown is when you’re having too much of it, it increases your risk of dementia and diabetes. So moderate amounts [decrease] your risk of heart disease, dementia, and diabetes; too much, you’re going to end up with those things. Another thing to keep in mind is that low doses of alcohol actually can help with promoting and increasing restful sleep, but when people are having too much alcohol it can affect sleep in a very negative way. This happens in a couple of different ways: sleep apnea, which is a breathing disorder that is characterized by heavy snoring and abnormal pauses in breathing, when people are having large amounts of alcohol, especially when it’s consumed in the evening, it can lead to a substantial narrowing of the breathing airway passage. This actually causes sleep apnea. When people are drinking large amounts of alcohol, this can lead to different concerns with sleep apnea. Again, people don’t have as restful a sleep. So you can see how this is working in a negative way for you, right? You drink too much alcohol, you don’t sleep that well, then the next day you’re feeling tired, and as a result of feeling tired, you probably end up eating more because you’re feeling this sense of fatigue and you think if you eat a bit more it’s going to help wake you up. So you have to recognize that too much alcohol does have an effect on body and soul alike. What do we need to do when we are trying to have a healthy relationship with alcohol? First and foremost, I think we need to use the Church calendar as our guide. Again, this is so beautiful. It takes the thinking out of it for us. We look at our calendar, we notice that it’s a day that should be free of alcoholic beverages, and then on that day we just do not drink. It is bringing balance and moderation for us. As we heard from the teaching of Cyril of Jerusalem, wine is not bad, but taking wine with a sense of appreciation, with gratitude, puts it in is proper context. And that is exactly what a fast does for us. I’ll give my own personal example. If we’re in a fasting period, and we’re going without alcohol, and then all of a sudden, Saturday comes along and it’s a day that we can enjoy an alcoholic beverage. I tell you what: that first sip of beer, and even the second and third and the fourth sip of beer, are just amazing! You have such a sense of gratitude. The only thing you want to do in that moment is give thanks. There’s a [quotation] by Ben Franklin that says, “Beer is proof that God loves us and wants us to be happy.” I can sort of agree with that. It’s wonderful how the Church calendar not only sets up this plan of moderation for us when it comes to drinking; it also helps to set up a healthy practice with having a healthy relationship with both our food and our alcoholic beverages. In appreciation, a thankfulness, a sense of gratitude, is developed when we go without. You can see the wisdom that’s embodied in the Church that can help us with an overall approach to eating and also drinking. Another thing that is important to do is recognize that alcohol can be an appetite-stimulant. There’s a lot of current research also going on in this area, but alcohol is shown also to stimulate the portion of the brain that regulates appetite: your hypothalamus. It’s important to recognize that and to plan accordingly. I encourage people: have alcohol with a meal. When you have alcohol with a meal, it helps to control your blood sugar, and that’s a very important thing, because alcohol does have an ill effect on blood sugar. Especially excessive consumption of alcohol can make your blood sugar go down very fast. When we’re having it with a meal, we’re having that all into a healthy range. Not having too many peaks and lows and peaks and lows in our blood sugar can help with diabetes prevention. If you think about this in general, this is maybe why moderate consumption of alcohol can help in the prevention of diabetes, but too much alcohol can maybe cause it. There are other different factors that could relate to why it could be caused, but that’s just something to think about. What you want to do is you want to plan accordingly. Try as much as possible, if you know you’re going to enjoy a glass of wine with dinner, but maybe before dinner you’re enjoying an appetizer, maybe pour yourself a little bit of wine to enjoy with that appetizer and finish the rest of that drink with your dinner. As opposed to having one glass with the appetizer and one glass with dinner, try to just pour yourself a little less. Sip it, taste it, enjoy how it’s complementing the food, and then have the rest with dinner. Or, if you know you’re going to enjoy an after-dinner liqueur, maybe pour yourself a little less beer or a little less wine to enjoy with the meal, and then have that liqueur to follow the meal. As much as possible, try to have the alcoholic beverage with food. Traditionally, this is the way that alcohol is consumed. In cultures such as [those] in the Mediterranean region, it’s not really common to see wine being consumed without food, without a meal. That is just something to keep in mind: it is meant to complement the meal. Another thing that that ties into is making sure that you are hydrated. If you’re truly feeling thirsty, this is your body telling you, “I need a little bit of water. Can you hydrate me?” This is not your body asking for a glass of lemonade or an iced tea, or even a beer. This is your body asking for water. Let’s say you’ve been out in hot weather and you have been mowing the grass or you just got done—oh, I don’t know—you’re on a long hike. Something that you might want to do is first and foremost, hydrate yourself with some water, and then go ahead and maybe enjoy that wonderful beer with your lunch. I’ve seen it happen over and over and over again: people are out mowing the lawn, they come in and a beer just sounds so refreshing. They drink the beer and they’re shocked. They practically drank it in one gulp, but if they had that water first and they allowed themselves to hydrate, then they could have just enjoyed their beer with their lunch or maybe with their dinner or the appetizer that they were having. That’s important to keep in mind. Always have water close by. Allow yourself to become hydrated if you’re actually thirsty, and then go ahead and enjoy the beverage. I always try to tell people that when they’re consuming any sort of beverage that contains calories: Control the amount that you’re having. Serve yourself in smaller glasses, portion out a sensible amount, and sip the calorie-laden beverage, whatever it might be, whether it’s lemonade or a margarita, sip it. But when you’re truly feeling thirsty, that’s when you should have the water. It’s much easier to drink your calories than eat your calories, so keep that in mind. Sip the caloric beverage, whether it’s alcoholic or not, and let yourself be hydrated with water. That’s another thing that we can do to keep our alcohol consumption in balance. Another thing: when you’re choosing alcoholic beverages, to receive those health benefits that I was mentioning earlier, make sure you’re always choosing the real deal. Again—I mentioned this a few moments ago, but just to recap—when you’re having an alcoholic beverage, make sure it’s made up of all real ingredients. Wine and beer, that’s pretty much the way it goes. I’ve heard some beers now are adding some artificial flavorings to them. Yikes. Beer is wonderful without all that stuff added to it, so try to avoid those choices. When you’re maybe consuming a liquor, if it’s good-quality scotch and you’re just going to sip on it as an after-dinner beverage, that’s an okay thing to do. You just pour out a sensible amount, you relax, you take your time, you sip it. If you have to mix something with a diet soda, that might not be the best choice. Again: because the diet sodas contain the chemicals; it’s a fake beverage, so our body does not know how to process that effectively. Just drinking diet soda alone can lead to many different chronic diseases. You might want to consider, when you’re having a cocktail, that the cocktail is made up of all real ingredients. There are many different things out there. You could have something like grapefruit juice with vodka, if that’s your thing and that sounds like a refreshing cocktail for you. If you’re having a margarita, the margarita should be made up with real tequila, real orange liqueur, also known as Triple Sec, and real lime juice. Avoid the mixes that contain the food dyes and the high fructose corn syrup and all the added substances and chemicals that your body doesn’t need, and just drink the alcoholic beverages in a natural state, made up of all real ingredients. Finally, you should focus on sipping your beverage. We should sip our beverages, not shoot our beverages. That’s an important thing to keep in mind. If you’re shooting a beverage, first and foremost, it’s probably not the best quality alcohol if you have to shoot it, because you’re trying not to taste it, essentially. And, if you’re also shooting a beverage, you’re trying to maybe drink for the wrong reasons, just to be frank and sum it up. So remember that a drink should complement the meal. When a feast day comes along, and you’re going to celebrate and you’re going to have a wonderful meal and drink a special beverage, remember that this can be done for the glory of God. To recap, let’s just look at that teaching from St. John Chrysostom one more time. I believe through these teachings that we’ve reviewed together today, we see that food is not bad, wine is not bad, alcoholic beverages are not bad, but what we do with them can make them bad. So we need to look at our relationship with both food and alcohol in a way that glorifies God. When we do that, we are nourishing both body and soul alike. I hope this was a helpful lecture to give you some strategies on enjoying alcohol in a healthful manner. Take care!